Chimera is one of the two cards with a Greek name in the set - Charybdis Wellisk being the other. A Chimera in Greek mythology is an epheremal being, and the spell does exactly that, creates an illusionary creature. 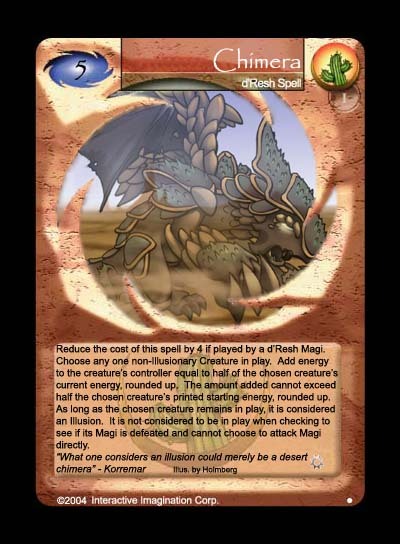 It's a Sand Strands that costs one more, but has the advantage of making your opponent's creatures illusionary and thus preventing them from attacking your magi. The art is part of the d'Resh calendar by Holmberg.